The new Professional version of our famous Fast Duplicate File Finder can now recognize not only 100% identical files, but can also Find Similar Files. The application performs a binary comparison of your files and can find similar files regardless of their type. You can easily find the most recent version of the files that you have edited and saved in different locations. The application can recognize similar files as word documents, excel documents, archives, images, movies, music files etc. 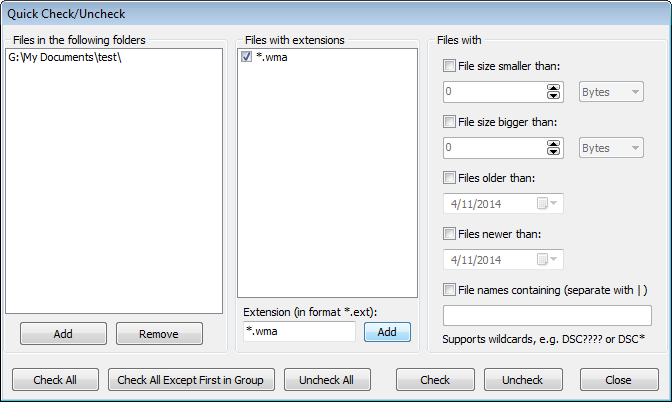 Download the Free Fast Duplicate File Finder version for a test. This entry was posted in Fast Duplicate File Finder, News and tagged Clone Remover, Duplicate File Finder, File Compare, Find Duplicate Files, Find Similar Files, Similar File Finder on January 14, 2010 by MindGems Support.